Private Bass Guitar tutoring lessons Audubon, PA. Check out some of our most popular teachers near Audubon, PA including Philadelphia, Princeton, Wilmington, Trenton and West Chester. learn the fretboard... learn to read composed music and chord charts! Enjoy learning to play electric bass with harmonic and rhythmic understanding. The bass drives the band! Fun and personalized lessons for aspiring bassists of all ages. Whether you are a complete beginner or advanced, my years of experience can show you a practical approach to learning music and exploring the bass guitar. Enjoy learning your favorite songs in a relaxed environment at my studio or online from the comfort of your own home. My students have many different musical tastes and lessons are always unique from person to person. Learn at your own pace. I build my program around your interests and goals. Become the musician you've always wanted to be and have fun doing it! Becoming a proficient bass player involves so much more than just instrumental technique. A good bassist needs to be able to establish a groove. They need to be able to make a strong musical connection with their drummer. In many ways, the bass player is responsible for making the entire band sound good. This, along with a strong emphasis on technique, is the central focus of the curriculum that I use to teach bass guitar. Focus on developing strong fundamentals of technique and reading while exploring different styles of music. I earned my master’s degree in jazz studies from The University of the Arts. As adjunct professor of music at Lebanon Valley College, I teach double bass, bass guitar, jazz improvisation, and directs small-group jazz combos. Working with students of all ages, I also teach workshops, clinics, and master classes at high schools, middle schools, and elementary schools in Pennsylvania and Maryland, as well as keeping a private teaching studio out of my Bucks County home. Lessons are available on upright bass, electric bass, improvisation, music theory, and ear training at all ability levels and all ages, from absolute beginners to high school students preparing for college auditions to adults. Some of my students have been accepted to various regional orchestras and jazz bands, and I'm very proud of their hard work. ined curriculum to develop my students’ technique, reading, and knowledge of theory, I cater to their interests by showing them how to apply what the are learning to the music that they already know and love. Tim is a wonderful teacher. He's very knowledgeable and is an excellent teacher. Awesome lesson and excited to learn the bass guitar! Students will learn the fundamentals of bass playing technique such as note reading, posture, groove, and dexterity exercises. Students will be exposed to various styles of music and bass playing and will be encouraged to bring in material from music they enjoy. As students learn and accumulate repertoire, they will be exposed to different performance techniques, ear training exercises, and improvisation skills. Students will be encouraged to improvise their own grooves in lessons as we cover different styles of music and the virtuosic bass players that made them groove! I am first and foremost a guitarist. However, I have spent a lot of time playing bass for rock bands, punk bands, and an african band. 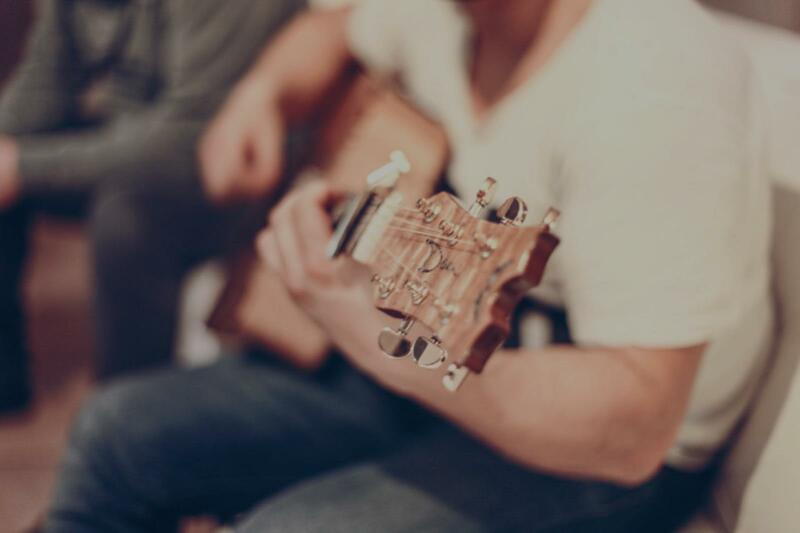 In addition, my training in classical guitar means that I am well equipped to teach fingerstyle bass because the technique is exactly the same. Can't find a teacher in Audubon, PA? "I am very new to the instrument. Michael is patient and teaches me a lot of new knowledge to learn and practice." using on the technical. upbeat even on the difficult days so struggles don't make you feel like giving up but push you to succeed." n music theory in a clear manner. He also was able to pinpoint the areas I needed the most work in, and then developed drills for me to use at home between lessons. His teaching style helped me develop from a below average bass player to a proficient level…in less than 6 months! I highly recommend Jon no matter your experience level." oach geared to my learning style - we have switched directions several times. Andrew's attention to detail and his desire for me to learn the right way is more than impressive. There have been lessons where I have not played a note but instead focused on reviewing different concepts. I'm fifty-seven years old and things don't come as easy as they use to and I really appreciate Andrew's patience and availability. I highly recommend Andrew for someone who is serious about learning to play the bass." "Knows his stuff, easy going and fun to work with." Philadelphia, PA teacher: Vince T.
"My son was very happy with Jonathan's approach and is excited to learn the proper way to play bass." cal knowledge. Collin was incredibly patient with me from the get go, and had a lot of insight as to what tunes would be good for me to start with and what exercises and scales would suit my specific level of learning. He was patient and kind with me, and went at exactly the pace that I needed him to. Whenever I was struggling with a scale or bass line, he would immediately notice, slow down, and show me note for note what I was supposed to play. Conversely, whenever I was learning quickly and with ease, he would react accordingly and speed up the information a bit or move on to more difficult tasks. Collin a very skilled musician himself which makes it all the more inspiring to take lessons from him. He makes every lesson fun and informative. After each lesson, I felt pumped to practice and play during the week between our lessons. Collin is an incredible guy and a wonderful instructor - highly recommended!!!" "Andrew is a fantastic teacher! gigging musician so he plays a lot. If you want to play in a band or play with a group he has feedback on that information for you as well! I personally don't think you could go wrong with a teacher like Andrew."